Vincent Bones is the newest winner of Idols South Africa – and drives off in style in his brand-new Ford Fiesta 1.0 EcoBoost Titanium, fitted with the EcoBoost engine that has won the International Engine of the Year award an unprecedented three times in a row. Vincent’s attractive new set of wheels is bound to bring him loads of attention, too, finished as it is in the range-topping Titanium trim. He’ll be able to belt out his latest tunes to a six-speaker, MP3-compatible audio system with steering wheel-mounted controls; while SYNC, Ford’s in-car entertainment system. SYNC will also double as his on-the-go personal assistant, allowing Vincent to make calls using simple voice commands. Vincent is already well accustomed to the Fiesta: the sporty hatchback also features in the music video to his first single, “Let Me Love You”. Vincent, 29, from Pietermaritzburg is a church worship leader whose life story – he became a street child at 12 after his mother and uncle passed away – has touched a legion of Idols fans. He’s now nabbed the ultimate prize after a two-hour Idols finale held at the Big Top Arena at Carnival City, during which Bongi Silinda, 24, from Nelspruit was announced as the runner-up. 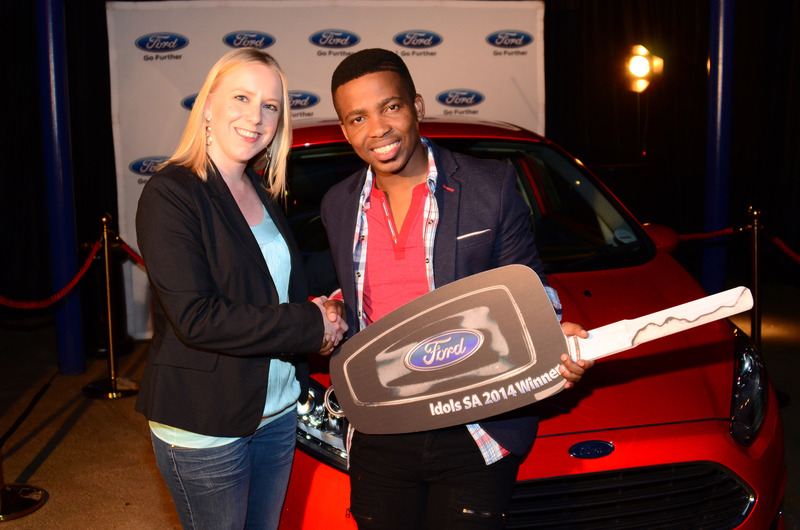 This year marks Ford’s fifth year as a major sponsor of Idols South Africa.